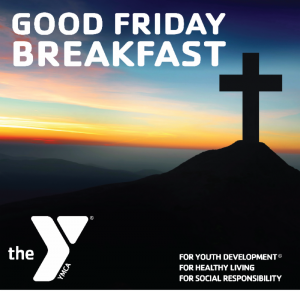 Come join us for a community Good Friday Breakfast Service, sponsored by the Muncie YMCA, at the Horizon Convention Center. Free and open to the public. Featuring guest speaker: Sujo John, 9/11 survivor and music from Cook & Belle. Due to limited seating, all attendees must RSVP by April 5, 2019. Contact Tonya Locke via email: tlocke@muncieymca.org, or 765-741-5534. To help make this event possible, table sponsorships are available for $500 per table of eight. Table sponsors will have the option of personally inviting and filling a table, or providing a table to be filled with community members that otherwise would not be able to attend.